Purpose: Since FDA approval of infliximab biologics have become the mainstay of IBD treatment. Biologics directly interfere with and reduce the severity and frequency of bowel inflammation with evidence of reduced carcinogenesis in IBD animal models, but the clinical impact of biologics on IBD-associated colorectal cancer (CRC) remains uncharacterized. Previous studies comparing oncologic outcomes of IBD-CRC versus sporadic CRC (sCRC) have demonstrated conflicting results, but these studies were performed using suboptimal, non-representative databases or performed prior to the widespread use of biologics. This retrospective population-based cohort study aims to characterize the clinicopathologic features and oncologic outcomes of IBD-CRC as compared to sporadic controls in the US Medicare population. As a secondary aim, we evaluate the impact of biologics on IBD-CRC presentation and survival using a subgroup analysis of the IBD-CRC population with a history of biologic use. Methods: Using the SEER-Medicare database, all patients with a diagnosis of colorectal cancer were identified from 2000-2013. IBD patients were then identified within this population and the clinicopathologic features of IBD-CRC versus sCRC were compared. 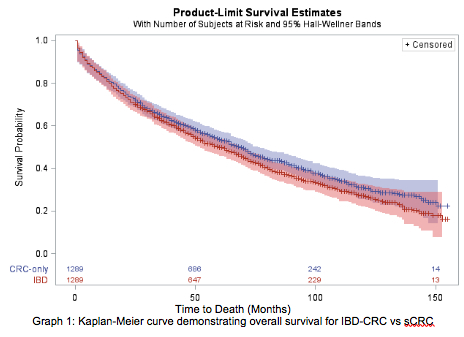 Propensity matching with a Cox regression model was used to calculate differences in survival between IBD-CRC and sCRC. Within the IBD-CRC group, a subgroup analysis was performed to compare the clinicopathologic features of IBD-CRC patients with a history of biologic use as compared to IBD-CRC patients such use. Results: Among 121,740 patients identified with CRC, 1,501 patients with IBD were identified (1.23%). IBD-CRC patients were younger (61.6% vs 55.3% < 80 yo, p<0.01) and more likely to be Caucasian (91.3% vs 84.2%, p<0.01). Stage at diagnosis was lower for IBD-CRC patients (30.5% vs 24.1%, p<0.01 presenting with stage 1) while tumor grade was higher (22.9% vs 18.9%, p<0.01 grade III). Rectal cancer was more common in the IBD-CRC group (19.1% vs 15.3%, p>0.01). Histology evaluation demonstrated higher rates of signet ring cell carcinoma (2.6% vs 0.9%, p<0.01) and mucinous adenocarcinoma (10.9% vs 8.9%, p<0.01) in IBD-CRC. In a propensity matched sample, a hazard ratio of 1.12 (p<0.01) was calculated for the IBD-CRC group translating to ~12% increase in hazard of death at any time. Overall survival rates are reflected for both groups in the Kaplan-Meier graph (graph 1). Sub-group analysis of the IBD-CRC patients with a history of biologic use is pending. Conclusion: IBD-CRC tumors are clinically and pathologically distinct from sCRC tumors. Despite widespread use of biologics for IBD treatment, IBD-CRC still portends a distinctly worse prognosis as compared to sCRC. Further evaluation of genetic and molecular differences is necessary to understand the pathophysiology of IBD-CRC and the role of biologics in its prevention.